Sneak preview. - Thread under construction. This thread is about Snapchat. How to setup a real 24/7 autopilot system. How to get the most out of it. How to avoid mistakes. How to scale it up. - Many advantages of Snapchat, compared to over-saturated platforms like Facebook, Instagram, YouTube etc. 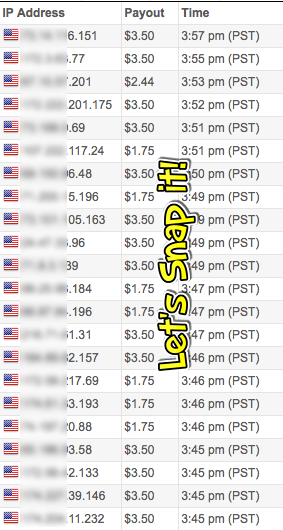 - Different methods how to earn money with Snapchat traffic. - Interesting usage scenarios with screenshots and videos. - Several ways how to boost your conversion rate. - Answers to the most important questions. - Detailed comparison of several tools you could use to automate your daily Snapchat tasks. - Many advantages of using tools, compared to expensive Snapchat Ads. Notice 2: The content of this tutorial is the intellectual property of CharlieHarper @ CPAElites.com and protected under copyright. You are not allowed to use text, images, videos or any information outside of CPAElites.com (e. g. shares at forums, blogs, social networks, videos, messengers, groups etc.). The distribution outside of CPAElites.com is strictly prohibited. You can start with almost nothing in your hands. You only have to create a single Snapchat account with your smartphone or tablet (iOS, Android). Spread your Snapchat username at social networks, dating platforms, forums etc. or add some friends you found on these platforms. No matter if you want to use classic CPA offers, CPI, content lockers, adult dating, premium adult content or other niches, you simply create one story post to reach all of your friends. Even users that are not your friends can see your story posts, after you set your story visibility to "everyone". You don't need aged Snapchat accounts. The age or history of Snapchat accounts doesn't matter at all. You can start with freshly created accounts. You don't have to buy Snapchat accounts. You don't have to verify your Snapchat accounts by phone/SMS. You only need a valid email address to receive emails in case of problems. You don't even have to verify this email address to start with story posts. So you don't have to buy phone numbers or SIM cards. "Swipe up" links will boost your conversions. At other platforms you have to watermark your images or videos with your domains. Visitors will have to type in your domains manually, a huge part of them won't do this. At YouTube you are not allowed to include your URLs into your video descriptions, without taking the risk to receive a report or getting banned. At Snapchat visitors of your story posts can simply "swipe up" your links with their finger, they don't have to enter URLs, they'll be redirected to your landing pages. You don't need high quality proxy servers. Snapchat doesn't care about the quality of proxy servers. You don't need residential proxies, 3G/4G proxies, dedicated proxies, ... Even the worst public proxies will work. Snapchat doesn't really ban you. Live content: "39s ago" (39 seconds ago). Spoofed timestamp, although this video is months old. No additional marker "from Memories". This video will stay for 12 hours only (usual Snapchat posts will stay for 24 hours). A duration of 3, 6, 9, 12 hours reduces a risk of possible reports and account bans dramatically. Looks legit to any viewer. Outdated content: "2 months ago". Additional marker "from Memories" proves the usage of a fake APK or cheap script. This image will stay for 24 hours, like all usual Snapchat posts. A duration of 24 hours leads to a higher risk of possible reports and account bans. Looks unprofessional to viewers, smells fishy. (2018-08-05, 08:17 PM)timilak65 Wrote: Anyone can explain how to promote CPA using snapchat? - A custom thumbnail (independent from the picture or video you upload) to get additional attention and build up trust (the official Snapchat iOS and Android apps don't allow this). - A custom caption (text layer on your pictures and videos). - A custom time how long your pictures and videos will be visible, instead of 24 hours, e. g. 3, 9, 12 hours (the official Snapchat iOS and Android apps enforce 24 hours here). - The usage of "live content" (pictures and videos), not to be displayed as "upload from the gallery", even if the content has been produced weeks or months ago (the official Snapchat iOS and Android apps don't allow this). - Spreading the usernames of your Snapchat accounts at other social networks (Instagram, Facebook etc.) and other platforms (Reddit, YouTube etc.). - Scraping usernames of Snapchat users from other networks and platforms (profiles, posts, videos). - Automated scraping usernames of Snapchat users inside Snapchat (officially not supported by the Snapchat iOS and Android apps), mass adding them as friends. - Setting your Snapchat account to "Story visibility: everyone", so everybody can see your story posts, not only your friends. - I'm "only" the reverse engineer and coder of one Snapchat bot, I don't sell this bot, I never sold it, and I will never sell it. - The development started in December 2017 (! ), the bot is running very stable (although Snapchat updated many things). - There is a distributor in place to handle pre sales, sales and support (there will be a change soon). - The Snapchat bot was available for a limited audience. The distributor set an amount of limited slots, to avoid any over-saturation (like at Facebook, Instagram, YouTube etc.). - I can't tell you if there are any slots left for new customers currently, since I don't decide this. - The announced CPAElites "Snapchat Q&A" thread will follow in a few days (advantages of Snapchat, unique methods, comparison of ways to automate it, real life pictures/videos etc.). The content of this tutorial is the intellectual property of CharlieHarper @ CPAElites.com and protected under copyright. You are not allowed to use text, images, videos or any information outside of CPAElites.com (e. g. shares at forums, blogs, social networks, videos, messengers, groups etc.). The distribution outside of CPAElites.com is strictly prohibited. ... to be continued, very soon. Does CPAgrip allow motivated traffic? (2019-02-04, 06:49 PM)jarekb321 Wrote: Does CPAgrip allow motivated traffic? This thread is about Snapchat only. As far as I know (since 2013), CPAGrip doesn't reject incentive traffic, as long as it's legit. At least I made 6 numbers with incentive CPAGrip offers over the years. I am very interested in starting this ! Could I please PM you some questions?